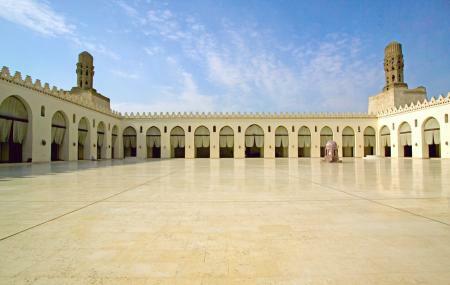 The Al-Hakim Mosque was built with the help of funds from the neighboring Arab states. The marble floors of the mosque show that the stones belong to some old architecture. The mosque features massive yard as well. During the rainy season the mosque is at its best as everything tends to reflect in the wet season. The holy shire is quite a peaceful place and should not be missed when in Cairo. How popular is Al-hakim Mosque? People normally club together Manyal Palace Museum and Muez El Deen Allah Street while planning their visit to Al-hakim Mosque. Few mosques are as well preserved and welcoming as Majid Al Hakim. Definitely visit if you're a traveller in the area. It has some beautiful architecture worth seeing. Photogenic and must be mandatory desrination while visiting Muiz St.